Jael: A Woman with a Plan! The Bible praises Jael, calling her most blessed, then goes on to laud not her submissive, gentle virtues, but her rather gory actions. 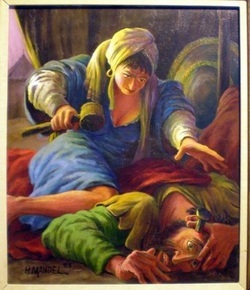 Notice again, that Jael is praised for killing Sisera, yet does not continues to view her a feminine. Today we seem to live in fear that if women serve the Lord in "non traditional" ways, they will somehow become. More, sometimes we believe a woman who acts in non traditional ways has abandoned, or will abandon her femininity. Jael assumes the traditionally male role of assassin in her service to the Lord; however, she continues to be "most blessed of women". The Bible restates her maternal acts of nurturing-giving milk, echoing the nursing of a child. She brings him curds-much as a modern mother gives her child wholesome oatmeal (porridge, for our UK readers). The final verse, some have suggested, carries overtones of sexuality, of the man falling at her feet. At the time, the Bible provides a graphic (almost R rated) description of the action. Jael strikes a blow, crushes his head, shatters and pierces his temple. These actions stand in stark contrast with the maternal, "feminine" images just before.